Strongest in the area of syphilis, this collection has good coverage of all the venereal diseases. The collection includes the first edition of Girolamo Fracastoro’s Syphilis, sive Morbus Gallicus (1530), which is a long poem that gave rise to the term “syphilis.” Another important work is the first Latin edition of Ulrich von Hutten’s treatise on guaiac, De Guaiaci Medicina et Morbo Gallico (1519). Guaiac wood was considered to be a cure for syphilis. Other works include one by John Hunter and the beautiful dermatological atlas of Jean Louis Marc Alibert. Cole portrait finds its way home. 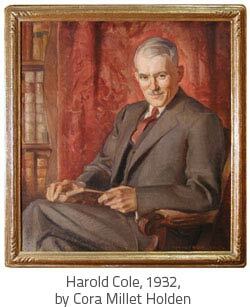 In June 2004 we became the happy recipients of a fine oil portrait of Harold Newton Cole (1884-1966), a distinguished dermatologist who was also a great benefactor of the Cleveland Medical Library Association. The Cole portrait was painted in 1931 by noted Cleveland artist Cora Millet Holden (1895-1938), who painted the Asklepios murals that grace the grand foyer of the Allen Memorial Medical Library. Holden chose to portray Cole seated in his study, surrounded by his cherished library of rare books. This lovely portrait of Dr. Cole comes to us from his granddaughter, Barbara K. Kinder, M.D., F.A.C.S. Dr. Kinder is the William H. Carmalt Professor of Surgery at Yale University School of Medicine. This portrait will find a fitting home on the walls of the Cushing Reading Room of the Allen. Dr. Cole’s career was long and distinguished. Following graduation from Western Reserve in 1909, he pursued postgraduate study in Zurich and Paris. It has been said that while living in Paris (1911-12) “he succumbed to the blandishment of the bookstalls,” and thus began his lifelong joy of collecting. Upon return to Cleveland, Cole established an active practice and taught as Clinical Professor of Dermatology and Syphilology. He was a Trustee and President (1950-51) of the Cleveland Medical Library Association, as well as a founder of the American Board of Dermatology and Syphilology, President of the American Dermatological Society (1933-34), and corresponding member of many dermatological societies in Europe and South America.